The X-Rack system makes SSL's large console technology much more accessible - so much so that we were reluctant to send it back! Although there are a fair number of big studios still in business around the world, the demand for large-format consoles is at nothing like the level it once was. Big consoles are still being made, of course, and Solid State Logic is still quite definitely one of the biggest players in this small market, despite a few rough years along the way. However, in addition to the Duality and AWS900 analogue desks, and the C-series digital consoles, the company has also invested significantly in another 'revenue stream', in the form of XLogic outboard equipment — bringing the SSL name and technology into the well-heeled home studio. The XLogic product range uses technology that is largely derived from the previous XL9000 J- and K-series large-format analogue consoles — the SuperAnalogue designs. Amongst the line up are several preamps, including the XLogic Channel, the 'E' Signature Channel, and the SuperAnalogue Mic Amp, as well as the G-series compressor and a multi-channel compressor. There is also an XLogic Alpha channel, a VHD preamp, and a collection of 'I/O Solutions', which includes various converters and digital interfaces. However, the flagship of the XLogic range is undoubtedly the X-Rack: a modular 4U rackmounting chassis and power supply unit, which can accommodate up to eight modules. The feature that helps the X-Rack stand out from the crowd is SSL's famous Total Recall facility — the ability to remember control settings and help the user reset the unit to a previous state. The X-Rack itself consists of a black, painted-steel case, with a permanent module installed at the right hand side, which is the power supply and Total Recall system. The back panel carries a mains inlet with retaining bracket for the IEC plug, a chassis-earthing post, MIDI In and Out sockets, a pair of nine-pin D-sub serial interface sockets (for daisy-chaining Total Recall data between multiple X-Racks and the AWS900 consoles) and a 25-pin D-sub socket providing access to the internal mix bus. A cutaway section of the rear panel reveals the interfacing associated with each module, which varies between XLRs and D-sub sockets, depending on the cards installed. Currently, the X-Rack range has six modules: the XR621 Mic Amp, the XR625 Channel EQ, the XR618 Channel Dynamics, the XR623 Four Channel Input module, the XR624 Eight Input Summing module, and the XR622 Master Bus module. Essentially, this is everything you need to build a couple of complete SSL channel strips, or a well-specified summing system, or some elaborate signal-processing tools — or a combination of all of the above. The rack supplied for this review was fitted with all of the modules listed, in a rather strange combination that certainly proved the capability of the X-Rack, although I doubt many would want the same combination of modules if they were spending their own money! There are obvious candidates for future additional modules: an A-D converter would be one, and perhaps a remote-controlled monitoring section would be another, but the existing collection already caters for 99 percent of anyone's requirements very well indeed. Perhaps the best approach is to start with the rack chassis itself, since this underpins the functionality of everything else. The switched-mode power supply can accommodate mains voltages spanning 100 to 150V AC. The Total Recall section contains its own microprocessor and memory to hold 'TR' settings for the installed modules in any of 32 internal stores. These user memories can, if required, be write-protected, if required, and a stored setting can be compared with current settings through the LEDs on each module's front panel. The system stores switch and control settings against module slot positions, so if modules are moved around in the frame, stored TR settings will only be recalled and displayed if the same kind of module is in the same slot as when the setting was first stored. In addition to the 32 onboard memories, the Total Recall settings can be exported and imported via the MIDI interface as System Exclusive data, and up to three X-Racks can be tied into the Total Recall system of the AWS900-series consoles using the rear-panel nine-pin D-sub sockets. If used in isolation, the X-Rack's Total Recall system is simple enough to operate. The front-panel rotary allows one of the 32 memories to be selected, and LEDs indicate whether the memory is currently empty or write-protected. Current control settings can then be stored by pressing the Save button (pressing twice to overwrite an existing stored memory). To recall a TR setting, the encoder is turned to find the required memory, and then pressing the encoder knob accesses the memory, causing the LEDs on the various modules to indicate the relevant maladjusted settings. Any module with controls set differently from the stored setting is revealed by a large, flashing, red LED at the top of the module. Each rotary control has a red/green LED associated with it. If the light is green, the control has to be advanced clockwise; if red, it must be turned anti-clockwise. The precise match position is indicated by the LED being extinguished. Any push-buttons in the wrong position are indicated by illuminated LEDs. Once all the control settings have been matched to the stored memory's values, the red LED at the top of each module stops flashing and lights constantly. Pushing the Total Recall encoder knob a second time takes the unit out of recall mode, and all the modules' LED indicators revert to their normal operation. The Total Recall section has a couple of other useful buttons. One allows TR settings from one module to be copied to another of the same type, making it easy to match parameters across stereo pairs, for example, and also serves to delete unwanted Total Recall memories. The other button is used for configuring the MIDI settings, instigating write-protect, updating operating software, and various other housekeeping functions. The Mic Amp looks much like a sawn-off section from an XL9000 console. The microphone section at the top of the strip has four small push-buttons, to select a 20dB pad, phantom power, front-panel instrument input, and variable input impedance mode, and each button has an associated LED to indicate its status. The variable impedance button is associated with a rotary control that allows the microphone loading impedance to be adjusted between 1.2 and 10kΩ. A second rotary control adjusts the gain from +12 to +75dB. Each of these controls has a miniature, dual-colour LED placed above it, and this is used to indicate the required adjustment in Total Recall mode. The rear panel of the X-Rack. As well as the inputs and outputs of the various modules, there is MIDI in and out, a pair of 9-pin D-sub sockets for daisy chaining Total Recall data between multiple X-Racks and AWS900 consoles, and a 25-pin D-sub socket for the internal Mix bus.The mic input is provided by an XLR on the rear panel, while the very high-impedance instrument input is located at the bottom of the front panel. A push-button alongside the quarter-inch socket provides a ground-lift mode to help alleviate ground-loop problems. A separate line input section follows the mic input section, with a push-button to select the line input mode and a rotary control to set the gain over a ±20dB range. The physical line input is another XLR on the rear panel. A polarity inversion button affects the selected input. The next section provides independently-switchable high- and low-pass filters. The low-pass section is 12dB/octave with an adjustable turnover between 50 and 3kHz, while the high-pass section has a steeper 18dB/octave slope and an adjustable turnover between 30 and 600Hz. The final control element is the output section, comprising a pair of push-buttons to route the output signal onto the X-Rack's internal stereo record bus. Separate buttons are provided for left and right channels, but there is no pan-pot facility. A single tri-colour LED provides level metering: green for signals between -60 and +4dBu, amber for signals between +4 and +24dBu, and red above +24dBu (clipping occurs at +26dBu). The line-level output from the channel strip is also presented on a rear-panel XLR. Technical performance is impressive, with a THD+Noise measurement of 0.003 percent, frequency response within 0.1dB between 20Hz and 20kHz, and equivalent input noise of -127dB at 75dB of gain. The single-channel EQ module's controls are styled in the same way as classic SSL consoles, with the same four bands: shelf/bell top and bottom plus two fully parametric mids. The EQ parameters can be switched to follow the G-series curves instead of the default E-series, and there is an overall 'In' button to switch the equalisation in or out of circuit. The EQ's input and output connectors are XLRs on the rear panel, and the input socket has an associated push-button to change the sensitivity from +4dBu to -10dBV. The modules installed in the review X-Rack chassis, from left to right: XR621 Mic Amp, XR618 Channel Dynamics processor, XR625 Channel EQ, XR624 Eight Input Summing module, three XR623 Four Channel Input modules, XR622 Master Bus module.The Dynamics module completes the classic channel-strip setup and, again, looks much like its full-console equivalent. The upper half of the panel contains the compressor/limiter controls, while the lower half hosts the expander/gate. Both sections share a common gain-control element, the action of which is shown on two columns of LEDs that provide gain-reduction metering. The compressor/limiter section has the usual Ratio, Threshold and Release controls, plus two push-buttons. The first switches the side-chain between peak-sensing and average-level modes, and converts the default soft knee to a hard knee, for more accurate control of peak levels. The second button selects a fixed 3ms attack time, in place of the default programme-dependent variable setting (3-30ms). The expander/gate section is provided with Range, Threshold, Release and Hold rotary controls, along with three more push-buttons. The first of these configures the unit to act as a 2:1 expander instead of a full gate, while the second introduces a fast attack mode (100µs/40dB attenuation instead of 1.5ms/40dB). The last button is used to link the side-chain with that of any other dynamics modules in the rack. Although the button is located in the expander-gate section, it also applies to the compressor-gate mode, since the same gain-controlling element is used for both processes. The rear panel carries XLRs for the input and output, and a push-button selects a -10dBV input-sensitivity option (as with the EQ module). An external Key input is also provided on an XLR, and this can be engaged by pressing the front-panel Key button alongside the metering. The Four Channel Input module is exactly that: a minimal-frills line-input section, intended to form the input side of an analogue summing amp. Each of the four sections is identical, with a rotary level control and pan pot, and three push-buttons. The input level can be adjusted from fully off to +10dB of gain, with an indent at the unity position. A tri-colour LED indicates signal level, with the same colours as used in the Mic Amp's LED. 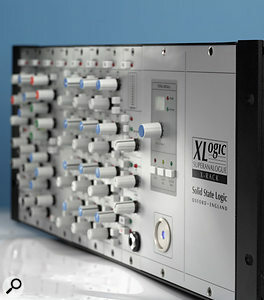 The X-Rack incorporates SSL's famous Total Recall facility, which allows the user to store control settings and return X-Rack units to a previous state.The input signal is always routed to an insert send, and a front-panel push-button allows the insert return to be routed back in to the signal path before the pan pot and output routing. Effectively this acts as an alternative, fixed-level line input to each channel. The channel signal is normally panned across the stereo Mix bus, but it can be sent to a separate stereo Rec bus instead if you press the corresponding front-panel button. 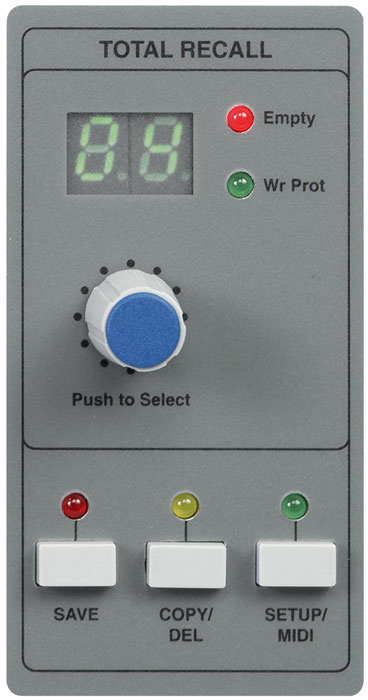 A 'Solo' button allows the channel signal to be auditioned on the Master module, if required, via the rack's stereo solo bus. Module connections are via 25-pin D-sub sockets, one for the main line inputs and the other for the insert sends and returns. The Master Module provides the summing and monitoring functions. The rear-panel connections are, once again, on a pair of D-sub sockets. A surprising amount of connectivity is provided here, including main and alternative stereo monitor speaker feeds, an external stereo monitor input, mix insert send and return, and, of course, the main mix and record bus stereo outputs. The top of the module is dominated by a compact, but readable, stereo bar-graph meter which indicates across a 48dB range. The mix section below features a rotary control to adjust the overall level of the Mix bus (the gain of the Record bus amps, sensibly, can't be altered), and push-buttons allow the Mix bus insert return to be used in place of the bus signal itself, or for the return signal to be mixed in with the Mix bus signal. The Record bus signal can also be summed with the Mix bus, if required, via another push-button. 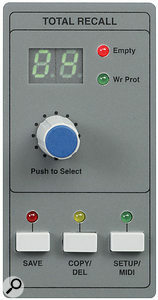 A fourth button allows the selected monitor section signal to replace the Mix bus signal. The Monitor section has push-buttons to select the Mix and Record buses, and/or an external input, and all three sources can be heard at once, if necessary. If a Solo button is pressed on any of the input modules, the corresponding signal is routed to the monitor section output, and a Solo LED illuminated to warn of the fact. The solo signal level can be adjusted using an AFL rotary control, and the main monitor output level is governed by a second rotary control. The monitoring output can be switched between the main output and an alternative set of speakers, and reduced to mono using front-panel buttons, and the usual Dim and Cut facilities are also provided on familiar-looking rectangular SSL buttons. A headphone socket is also provided at the bottom of the module. All three stereo buses (Mix, Record and Solo) are accessible via the D-sub socket on the rear of the main X-Rack unit, but the controlled signals are provided on the D-subs at the back of the Master module itself. The last module type currently available is the Eight Input Summing module, which is the simplest of all the modules from a control point of view. It was apparently developed after customer feedback for a line-input module to accommodate the outputs from multi-channel audio interfaces, sub-mixers and synthesizers. However, although this module doubles the connectivity of the Four Channel Input module already described, it doesn't have the Level, Solo or Pan controls. Instead, the eight inputs are configured simply as four stereo pairs, with fixed input sensitivity and an On-off switch. Each pair can be summed to mono, if desired, and the two pairs are equipped with insert send and returns. The outputs only feed the Mix Bus. The X-Rack system looks, feels and sounds like a mini SSL console. The SuperAnalogue sound quality is unmistakable and the Mic Amp, EQ and Dynamics units seem to behave and sound just like the full-sized thing — as, indeed, they should. The Four Channel line-input modules provide flexible convenience, but the new Eight Channel one will probably appeal more to those who want to sum a large number of external sources, perhaps from the multi-channel D-A converters of high-end DAWs. Four Channel Input module £564. Eight Input Summing module £517. This isn't unreasonable, given the quality of the modules and, as I mention elsewhere, it represents a significant saving on the equivalent stand-alone products. The Master Bus monitoring section manages to provide a lot of facilities in a very small space, but ergonomically I have to say it is something of a disaster. An improved version with an external remote-control panel would be very high on my wish-list. But sonically, it does the business, and it has all the facilities that are needed. This, at the end of the day, is what really matters. The nice thing about the X-Rack is that, with space for eight modules, you can configure both a high-quality input section, complete with EQ and dynamics, if necessary, as well as a multi-input summing and surprisingly versatile monitoring section. 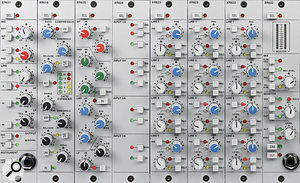 Just two modules would take care of the summing and monitoring of eight line inputs, while six more would provide two input channels with full EQ and dynamics. Or, if you drop the dynamics modules, you could have two mic inputs with EQ, and 16 stereo line inputs, plus four mono line inputs, and a Master Bus and monitoring section. Or.... well, I'm sure you could work out your own combinations. The point is that the flexibility on offer here is rather impressive, and it is easy to come up with various bespoke combinations that would be quite difficult and expensive to produce using more conventional equipment. On top of all this comes the built-in Total Recall system which, very usefully, doesn't rely on an external computer (unlike the broadly equivalent systems currently offered by other manufacturers). 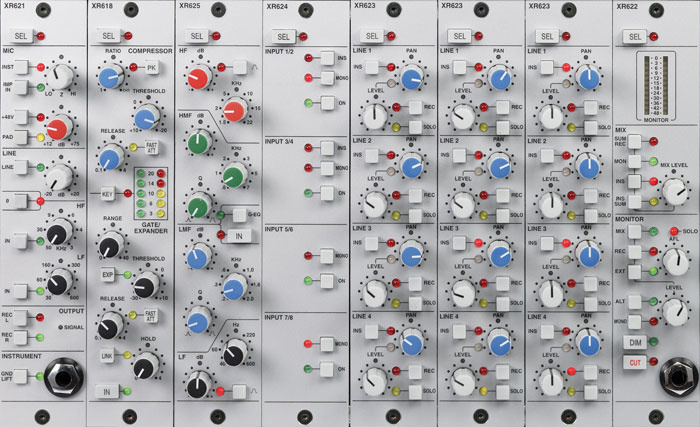 Looking at the prices of individual modules can make the X-Rack appear expensive, but it really isn't when you compare it with the stand-alone equivalents. For example, a pair of XLogic Channels would set you back the best part of £5000 in the UK, whereas an X-Rack fitted with pairs of Mic Amps, EQ modules and Dynamics modules would come in at under £4000. You get the same quality, and the same facilities, but with space in the rack for further expansion and a self-contained Total Recall system thrown in. If you have a hankering for an SSL signal path, and like the idea of modularity, expandability and the convenience of Total Recall, then the X-Rack ticks all the boxes in an impressive and very usable way. Sound quality is all it claims to be, facilities are comprehensive, usability is high, and the simplicity and intuitiveness of the Total Recall system has to be tried to be believed. It is fantastically easy to use, and while obviously not instantaneous, like recalling a new scene on a digital desk, it is a very quick and accurate way of resetting an analogue signal path. I was very impressed with the X-Rack in every way and was sad to have to return it! If you specifically want the SSL sound in a customisable modular system, the X-Rack will obviously be your best solution, but some other big-name manufacturers offer similar products, such as the API Lunchbox, the Audient Black series and the Tonelux modular system. SSL sound quality and styling. Flexible modularity for bespoke signal paths. Useful range of modules already available. Line input and Master modules require break-out cables. Master Module fiddly to use. The X-Rack is an excellent, cost-effective and hugely flexible way of bringing SSL's large console technology into smaller studio setups, and because it is a modular system you can pick and choose the best combination of modules for your needs. Sound quality is as impressive as you would expect, and a stand-out feature is the Total Recall system, which allows you to store settings and back them up to a computer (albeit as MIDI SysEx dumps), not to mention linking the X-Rack with SSL's AWS900 console.